OK so Monday night was the last night of level 70 arena. There will be a new Season starting December 16th. Full details on what's happening to Arena and your arena points below. Since the season is behind us I'll be back to regular posts. 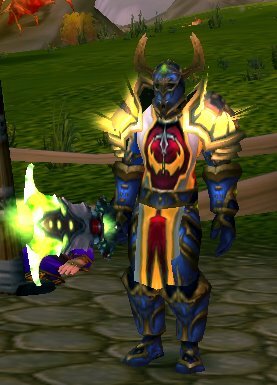 Also, since the season was ending asked our resident Gladiator Mage to dump his team and help me get that S3 weapon with an 1800 rating (I have been hovering in the low/mid 1700's). He said it would be more fun to take the rating to 2050 and get the S4 !! Sure enough within a couple of hours we hit 2050. Since I was maxed out on arena points I was able to pick up both my S4 weapon and S3 shoulders!.... They looks so great I updated my photo! Of course it won't help me with arena :).... But the increased DPS and armor should be great for leveling. I don't expect to waste money on gear until at least the high 70's and perhaps level 80. We have created this new thread to reflect some updates we have made to the way in which arena points and seasons will be handled as we transition into Wrath of the Lich King. We wanted to remind everyone that Arena season 4 is coming to a close. During next Tuesday's maintenance on November 11th, all arena teams, as well as ratings, will be wiped and arena charter NPCs disabled. However, arena points will persist until the beginning of the next arena season, or until a player reaches level 71. Thus, Arena points will be rewarded for rated games played this week and players will be able to purchase Arena items that do not require a team or personal rating. Upon the close of Arena season 4, players at level 70 will continue to be able to play skirmish Arena matches against other level 70 opponents even after Wrath of the Lich King launches. Arena season 5 is currently scheduled to begin on December 16th, and once that happens players who have reached level 80 will be able to compete in rated arena matches where they can gain arena points which can be used to purchase level 80 arena gear, as well as compete for end-of-season rewards. Players who remain at level 70 after Season 5 begins will only have access to play skirmish arena matches against other level 70 players. However, two new skirmish brackets will be made available (71-75, 76-80) for players who wish to hone their arena skills while leveling in Northrend. I hope you stick around for the arena in Season 5, I'd be very interested in reading your thoughts on Paladin Arena PvP once everyone hits 80 and we can all get a good idea of where balance lies. Oh I'll be there. The ammount of time I can devote to WOW has been severly reduced though... I only hope I can slog my way to 80 by the 17th of December!